The 2000 presidential election was transformative. It came down to Florida as the U.S. Supreme Court stopped the ballot recount on Dec. 9, 2000, 32 days after the general election. The election was even close in nearby Cedar County, Iowa where Al Gore beat George W. Bush by two votes, according to the secretary of state. In retrospect, too many people felt like I did. I was no fan of Bill Clinton, although he was more popular — with 65 percent approval at the end of his second term — than any president since Harry Truman. I hadn’t worked for the Gore campaign, figuring he was a shoe-in. We deprived Gore of a substantial victory and changed history. The work I’d taken on to support our family at the turn of the 21st Century was demanding and kept me from volunteering on political campaigns. I managed private fleets in the Eastern United States for an Eldridge-based trucking company. On election day I left home to visit our main customer, a Chicago-based steel services company, listening to radio coverage of election returns as I drove to a hotel in the western suburbs. After that night, and the Dec. 12, 2000 U.S. Supreme Court decision in Bush v. Gore, politics became personal in a way I hadn’t felt since the 1964 election of Lyndon Baines Johnson. 20 years later politics remains personal, although it has changed. With the rise of personal communications technology how we participate in politics is much different. Newspapers used to be a primary source of political information and in many ways still are. Our daughter brought a copy of the local newspaper to her first Iowa caucus with the idea information therein would help her decide for whom to caucus. The main benefit of regular newspaper reading is being informed. Reading them on line provides a side benefit of no newsprint to recycle. With a strong, daily background of what’s going on in the world, there are less surprises, and more opportunity to influence the course of daily events in politics and in everything else. People feel disenfranchised by our political process, but I’m willing to bet if they began reading a newspaper every day that would change. It is important to support journalists who work for newspapers by paying for a subscription. I have four: the Solon Economist, the Iowa City Press Citizen, the Cedar Rapids Gazette and the Washington Post. The cost is $309 per year, a reasonable amount for the information provided. A lot of society doesn’t appear in newspapers. I’m thinking of key people in the community and how they spend their time. I’m not talking about that nice lady who details events in her clutch of friends for the local society column. When I participate in local events, or sometimes if I just hang out on Main Street, I run into policy makers and local activists who provide insight into contemporary affairs. There is every reason to meet with people in a community to influence politics. Face to face, it’s harder to take extreme positions. There is a form of personal commitment, the idea we might run into each other again being a social glue that can bind us together. We may not agree on politics, but in person communication can be the main way we identify common interests and work on things together regardless of politics. The first time we logged on the internet from a home computer was April 21, 1996 with an expensive Acer desktop. The three members of our family gathered around it in the kitchen, listening to modem squawk as we connected to an unknown world. We didn’t know what to expect and I spent time exploring, including discovery of message boards, web sites, and information about corporations and our government. The main change in 23 years is adoption of computers as a fundamental part of life. Part of what made this possible is the build-out of internet service providers and the advent of the laptop computer. Laptops enabled computer mobility that didn’t previously exist. In a nationwide campaign organizers could tote their devices with them to multiple locations, then connect to their campaigns via a local ISP. In 1996 software applications were mostly installed on a hard drive. Now on line applications and cloud computing have become prevalent. Developments in the computer itself, internet service providers, and progress in applications, isn’t what changed our politics. How we use them is. Consider the spreadsheet application — first LOTUS 1 2 3, then Microsoft Excel. They were a boon to the accounting profession. Largely gone are the columnar sheets written in pencil that tracked business revenues and expenses in favor of machine calculated totals and projections. Spreadsheets were rapidly adopted by accountants and businesses because of the labor savings they enabled. Few accountants would argue we return to non-spreadsheet days. As important as spreadsheet applications have been, relational database applications made rapid headway in many fields, including politics. Combining a number of spreadsheets and establishing links between them, a political organizer could track contact with voters, monetary contributions, events, and demographics in specific geographies. Database applications revolutionized how campaign organizing was done. After the 2000 election, computers and the internet began to play more significant roles in our politics. A notable innovator was Joe Trippi, author of the book The Revolution Will Not Be Televised: Democracy, The Internet, and The Overthrow of Everything. While working for the 2004 Howard Dean presidential campaign Trippi discovered ways in which the internet could be leveraged to organize and solicit monetary donations from a broad range of voters. Another innovator and perhaps the most significant to campaign technology was Michael Slaby, chief technology officer of the Barack Obama for America campaign in 2008. His work of creating a relational database that tied campaign data to external demographic information, created voter targeting analyses that contributed significantly to Obama’s election. Slaby went on to develop The Groundwork in 2014, which is “… responsible for the critical functions of modern campaigning by using technological resources to consume digital data about voters, and then developing the technological means to assist presidential campaign target voters for fundraising, advertising, and outreach,” according to Wikipedia. Hillary Clinton was a client of The Groundwork in the run up to the 2016 election. At the 2006 Harkin Steak Fry at the Warren County Fairgrounds near Indianola, Iowa. I took a photo of the keynote speaker, Barack Obama, on my flip phone just before shaking his hand in the rope line. The flip phone was an important development because it freed us from landlines and from being anchored to a specific place while communicating with widespread colleagues. It also provided a low resolution photography function, eliminating the need to carry both a phone and a camera. At the time I had a separate Blackberry for work, which allowed texting and email capability. 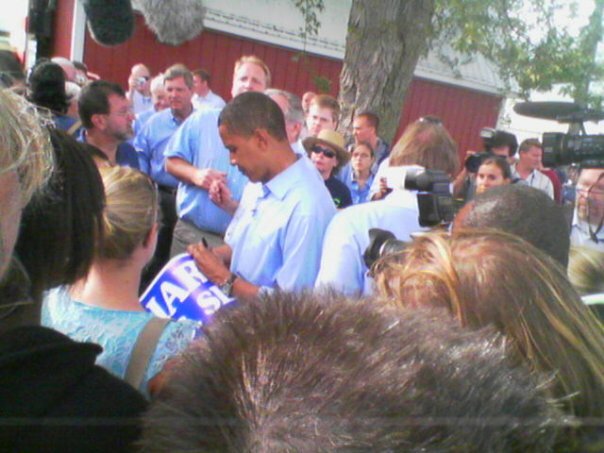 Many organizers carried a Blackberry during the 2008 Obama campaign. In 2012, I purchased my first smart phone to support political work for a state house election campaign. Staying in communications with others was important to moving the campaign forward. The smart phone made using applications like text messaging, email and eventually social media wherever we are possible and brought us to today. In a brief post it is hard to be encyclopedic about technology change that influenced our politics. This analysis is from a Democratic perspective, although Republicans adopted similar technologies. I didn’t discuss the impact of social media on our politics, although it was enabled by the technological developments described, especially the advent of smart phones. What made the 2000 election significant is it activated a large number of voters like me who had become less active in politics. As technology became more a part of our lives, many of us became insular in our approach to politics to the detriment of broader social interaction. While science drove technology and made it possible, the unintended consequence was a dumbing down of the electorate. Insularity combined with rejection of expertise, facts and even truth has created a society where groups reject science in favor of primitive behaviors. Nothing better characterizes this movement than the 2014 measles outbreak in 21 states and the District of Columbia when vaccines to prevent the disease were ubiquitous. When I propose reading newspapers to stay informed and interacting with humans in society it sounds old-timey but it’s not. Getting information from reliable sources is more important today than ever. Equally important is having a framework through which to view new information, given the democratization of communications means and ongoing social insularity. Sorting is happening in society that separates the rich from the rest of us, and pits people in one social cohort against others. The rise in communications technology and connectedness is making it worse. What is the path forward? My initial answer is better education, especially in the K-12 system. Helen Keller gave an apropos path when she said, “The highest result of education is tolerance.” We don’t need to go back to school to learn that.